Decaf coffee is unlikely to be harmful for your health if you drink it in moderate amounts and without an excess of cream or sweeteners. However, decaf coffee can raise cholesterol levels, which may be of concern to people at risk for heart disease. Some people may also experience gastrointestinal problems if they regularly drink super-size decaf coffee drinks. All types of coffee drinks, including decaf coffee, contain two natural chemicals -- kahweol and cafestol -- which can raise your cholesterol. When you prepare regular caffeinated coffee using a paper filter, most of the kahweol and cafestol is filtered away and does not find its way into your cup of coffee. However, decaf can raise cholesterol levels even if it is prepared using a paper filter, reports the Harvard Family Health Guide. The exact reasons why decaf raises cholesterol are largely unknown but likely involve the chemical processes by which coffee is decaffeinated. The cholesterol-raising properties of decaf may also be a result of the types of beans used to make decaf coffee versus regular coffee, according to a report by New Scientist. Decaf coffee is made using Robusta beans, which may contain very high levels of kahweol and cafestol compared to Arabica beans used to make regular coffee varieties. Overconsumption of decaf coffee can result in a number of different gastrointestinal issues. A report in Medical News Today explains that when overused, decaf coffee can cause heartburn, ulcers and gastroesophageal reflux disease, a precursor to esophageal cancer. While one or two cups of decaf coffee a day is not likely to cause any serious gastrointestinal issues, regular consumption of super-size coffee drinks larger than 16 oz. may lead to some complications. 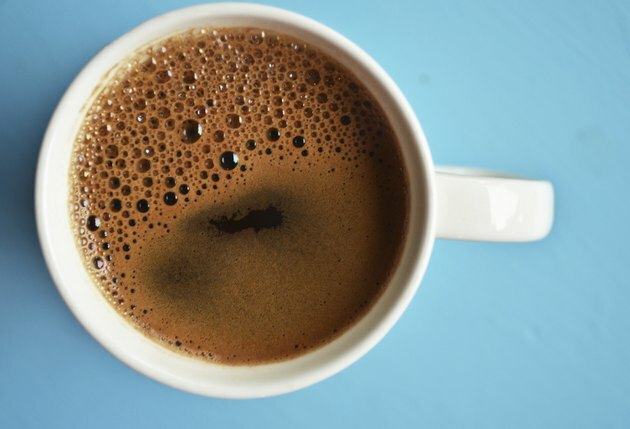 A cup of black decaf coffee has only about 5 calories. Many decaf drinkers, however, do not drink pure decaf coffee but choose to add cream and sugar or drink decaf espresso lattes that contain a lot of whole milk. Unfortunately, overly sweetened, milky coffee drinks are packed with fat and calories. For example, nutritional information provided by Starbucks Coffee says that a 16-oz. decaf Caffe Mocha contains 360 calories and 19 g of fat if it includes whipped cream. Such coffee drinks can wreak havoc on the waistline, as well as the wallet, if you are trying to maintain a healthy weight. Drinking one or two cups of black decaf coffee each day is unlikely to have any adverse health effects. If you have high cholesterol, or if you are at risk for heart disease, you may want to discuss your decaf drinking habits with your doctor. Decaf coffee does contain some antioxidants, which can have some health benefits. As recommended by Medical News Today, however, decaf coffee should not be used as a substitute for the antioxidants in fruits and vegetables.